What you are looking at here is an oddity that I have encountered several times before. 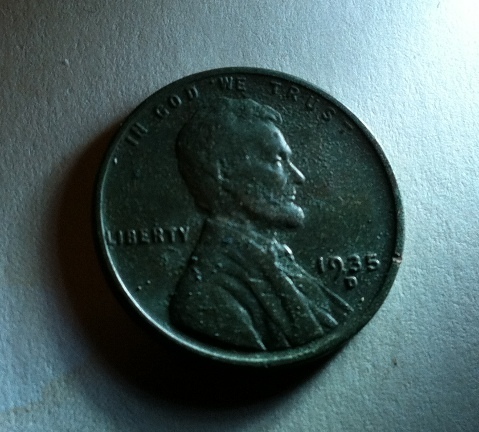 This wheat cent gave a VDI of 50 on the V3i during my lunch time hunt. Just so you know, nickels read 52 on the V3i. The signal was solid and repeatable. And it was shallow too! Three inches under the ground! No other signal was forthcoming after I extracted this coin. Why does this creature exist? My guess is that it has something to do with the Dirt Matrix. And what is that you ask? Well the Dirt Matrix is the conglomeration of variables in the soil such as minerals, EMI, moisture, bug poop, and the price of tea in China. 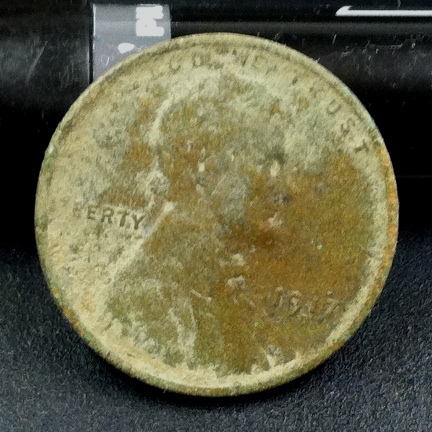 All of these things came together and when the signal from my detector hit the coin, the signal returned did not report a Wheat Cent but rather something else. And it doesn’t only affect Wheat cents. Silver dimes and clad coins have come in as something else on the V3i and the AT Pro. 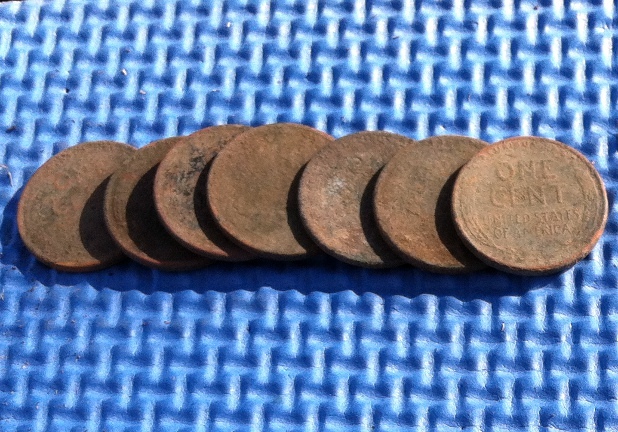 Once, I dug up a clad quarter a couple of inches under the ground that gave me a solid iron grunt on the AT Pro. So what are we to make of this? Sadly the answer is obvious and painful: Dig Everything. At lunch, I went to an old school site. 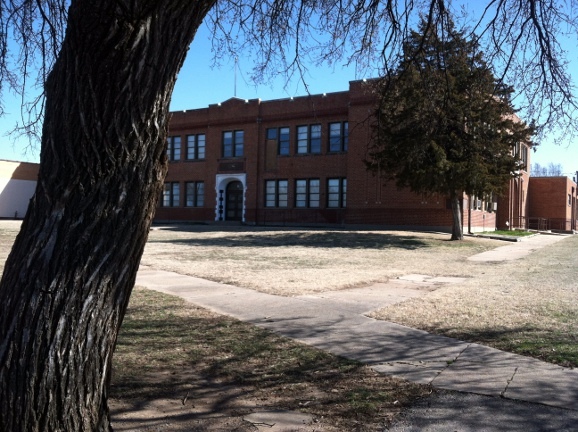 The school that once stood there was torn down about two or three years ago and the site is now a city park. 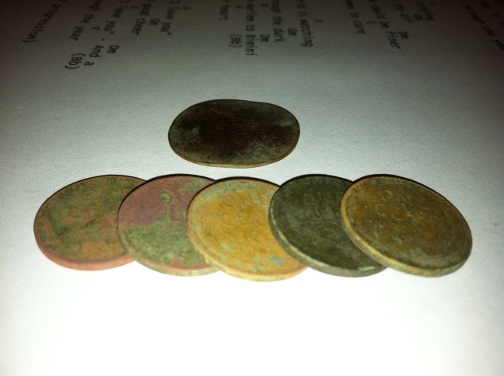 The school opened in the very early years of the 20th century and so the potential for very old coins is there, except that the school was hunted heavily long before it was demolished and has been hunted heavily ever since. 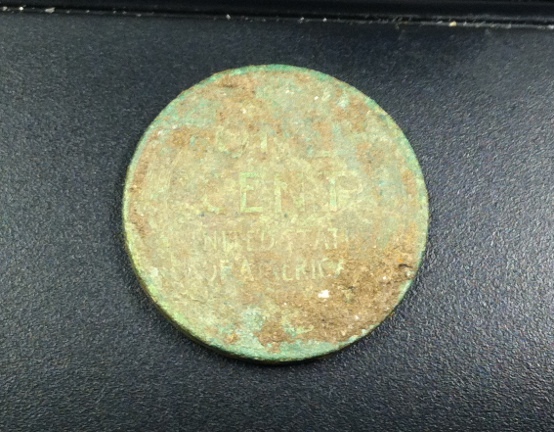 So my expectations for this hunt were to find a Jefferson nickel or two and because of the low expectations I hunted loosely without even bothering to overlap my swings. 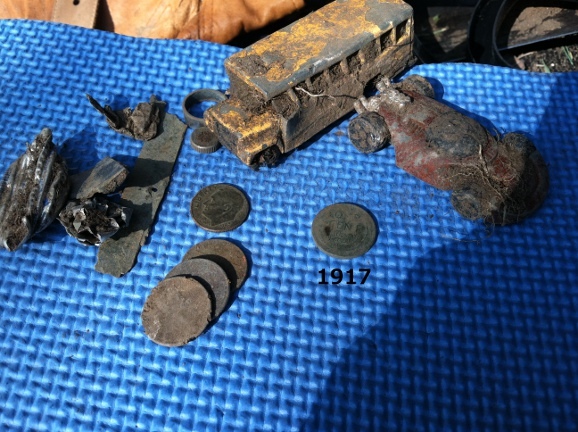 At the end of my 45 minutes I was surprised by my finds. I was very surprised by the toy cars. They usually sound like quarters on many detectors so why were they missed? 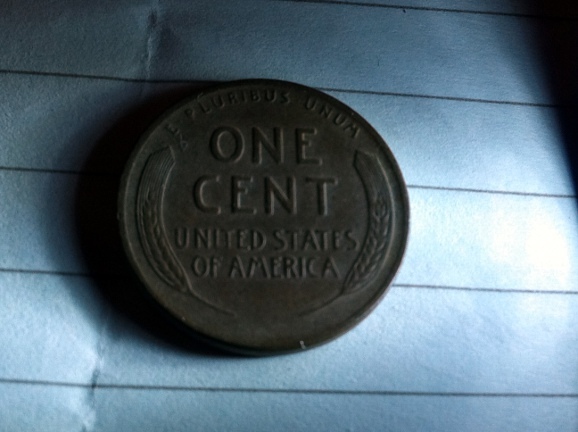 The clad dime was another unexpected find. Four inches in the ground surely people didn’t leave it there on purpose! 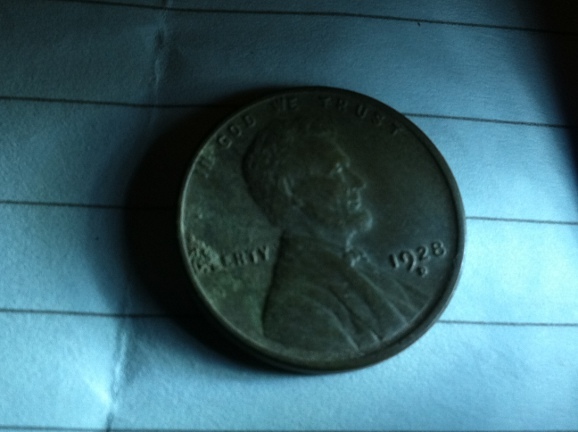 But the real shocker was the 1917 Lincoln cent. This baby was a little over six inches deep. 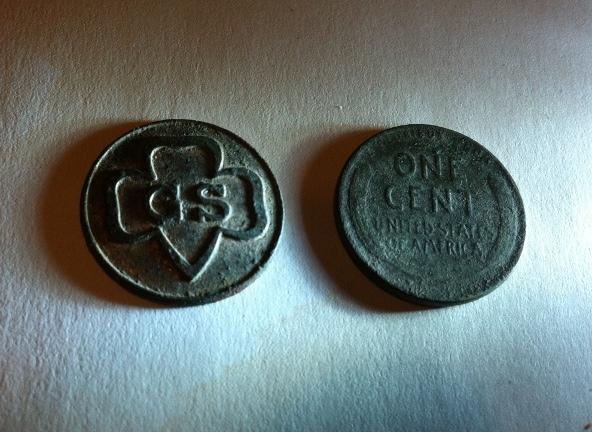 This wheat cent has the distinction of being the oldest coin I’ve dug up with the CZ-3D. Seems as if I need to grid this little site! I returned to Riverside park this evening. It was very, very cold but I am extremely excited about my new ability to sniff out old coins from the hunted out park. I decided to grid out a small area bounded by trees. The area was about 20 feet by 20 feet. I began searching and about three minutes into the hunt, bam! I got a high tone with no hints of iron. The VDI number jumped around but no matter what angle I swung the coil at, the signal remained free of iron. The depth indicated on the V3i was 5.5 inches. Nice. 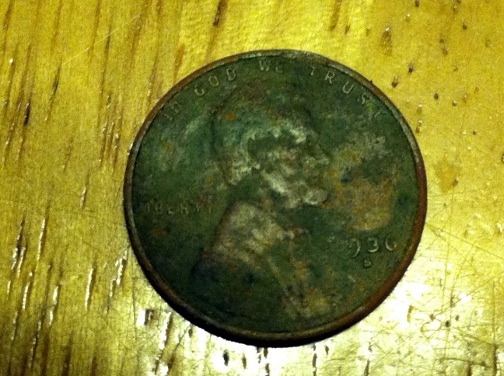 I dug this 1935 D wheat penny from the cold dirt. If you remember from my previous post, I set the White’s V3i to process the signal very slowly by setting the ground filter to 5Hz Band. I seem to remember reading that by setting the ground filter to 5 Hz Band, I tell the processor in the machine to take its time analyzing the signal. Anyway, the end result is that I have to swing very slowly to give the machine time to do its thing. It was brutally cold and even with gloves on, my hands were freezing. I decided to change locations after I found the wheat cent and went back to the old Girl Scout House to dig for mid tones. Soon into it, I got a nice repeatable mid tone with a consistent VDI at five inches of depth. I dug a hole and out came this Girl Scout emblem. It may have been part of a pin at one time. I was forced to stop when the sun went down and the wind chill was in the lower teens. My heart was aglow however. Suddenly this huge old park has become alive with possibilities for me. I love my V3i!!! 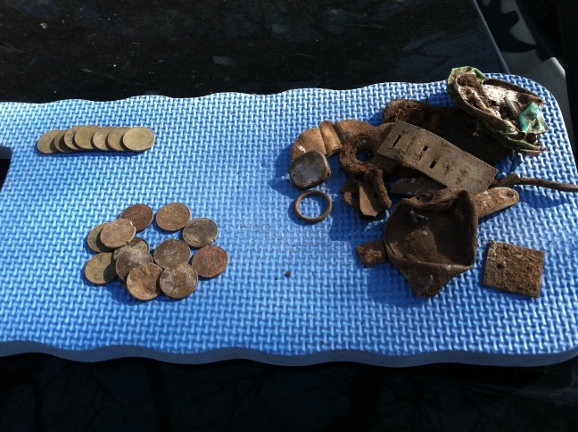 I hunted for six hours today looking for my first silver of 2012. 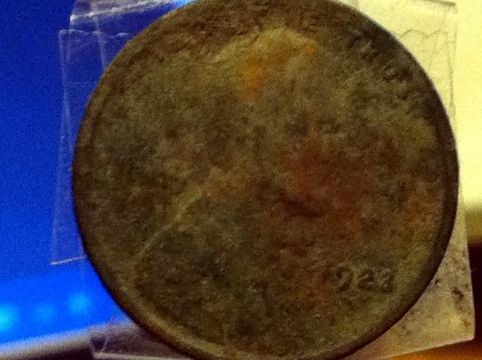 I was very hopeful when the first coin I dug up was a 1928D wheat cent. However, for the rest of the hunt, I found only clad. The city park where I hunted is very old and should contain plenty of old coins and although I found no silver coins today, I remain optimistic about my chances of finding 75 silver coins this year.